This Dallas group serves up swinging big band versions of hymns, spirituals and other Christian music. 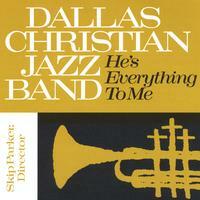 "He's Everything To Me," the DCJB's first CD, was recorded and released in 1998. Its ten tunes represent a cross section of the group's Christian repertoire, from the swinging "Just A Closer Walk With Thee" to the soprano sax-driven "Jesus Loves Me" and the Caribbean-flavored "To God Be The Glory." Engineered by veteran producer Byron Parks, the CD includes a guest appearance by longtime Dallas Jazz Orchestra leader Galen Jeter, who is featured on "Danny Boy."